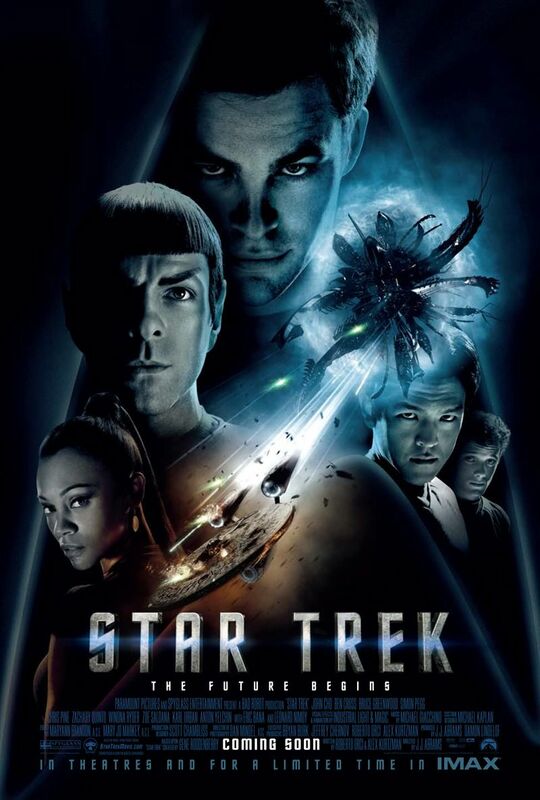 On a week where J J Abrams has been made the Director of the new Star Wars films, and with the Star Trek movie sequel soon to hit cinemas, a few of us watched the 2009 film in preparation on Saturday night. I first saw the Star Trek movie in Picadilly cinema with a work mate as a reward for a long week. Having never been a big Trekkie (I had seen some of the William Shatner and Leonard Nimoy series) I was excited to be able to get on board fresh and I loved it. This time around has only been my second viewing and I’m going to review the movie based on the re-watch, following it up with some reasons to watch the new movie this year. For more, including spoilers for the first movie, follow behind the cut. There’s something about the way Star Trek stories are told that makes me smile. I love a lot of different science fiction, and Star Trek, even in the new era, has something very old at its core. It feels dated even when it’s brand new. I like that feeling, the feeling that you are revisiting an old friend or are familiar with the kind of storytelling that’s being employed. There’s nothing gritty or emotionally traumatic about the story in this film, but there are the beginnings of friendships, characters and cultures that you can see spanning across many movies and adventures. The basic premise of the story is one about alternate timelines and revenge. A Star Fleet ship is attacked by a rogue Romulan vessel. Its captain Nero is out for revenge for a home world and a wife lost. As the story unfolds, it becomes clear that the centre of his hate is Spock, a young Vulcan. Nero blames Spock for his planets destruction and vows to destroy Vulcan and make Spock watch as revenge. Simple enough story, but also very clever. This movie is bringing along a new generation of Star Trek fans, but it also needs to appease the generations and legions of fans of the previous television series’. Setting this story up as part of an alternate timeline, one in which Kirk’s father (IT’S THOR!) was killed by Nero and therefore, set Kirk on a different path, allows new viewers to start from scratch, and perhaps older viewers to enjoy a new story without feeling their beloved characters and plots have been compromised. As the story progresses we are introduced to the Enterprise crew, Uhura, Bones, Scotty, Sulu and Chekov being the most notable. I hear a point of contention with this new film was the budding romance revealed between a young Uhura and Spock. As someone not vested in any previous story arc, I would say that this didn’t bother me. In fact, it was refreshing to see Kirk not get any girl he batted his eyelashes at, least of which Uhura, who comes across as a very intelligent and capable women. It might be a shame that she was set up as a love interest so quickly, but it did provide a much more solid introduction to Spock’s emotional side than might have otherwise been explored. It’s safe to say that while all of the characters of note from the series are given air time, this story is really about introducing Spock and Kirk and their friendship to a new generation. The friendship of course, gets off to a completely rocky start. Neither like the other and neither can see value in how the other operates. By the end, there isn’t a sense that these two have formed any close bond magically over the course of just one movie, but there is potential for a stronger friendship to grow organically and that is something I am keen to watch into the future of the movie franchise. I still think that casting Zachary Quinto as Spock was an inspired choice. Not only does he resemble Leonard Nimoy, he emulates the fine lines between Spock’s Vulcan and Human heritage, treading a line between fury and being completely removed from an emotional situation. The struggle with his emotions is written across his face, making his ancestry more believable and making him an interesting character to watch develop. Kirk is a slightly different story. I think Chris Pine did a pretty great job of coming off as a troubled youth with a bad attitude, coming aboard Star Fleet and ending up the Captain and the hero. Whether he seemed like he deserved this or not is more of a scripting problem than an acting problem, but certainly, I found Kirk to be the less relatable of the two and found it a bit of a shame that although there was a lot going on for the character, he always seemed two-dimensional. I hope this will change in time as Chris becomes more acclimatised to the role and as the image of Kirk that we all have in our heads waxes and wanes into something else. Chris’ Kirk doesn’t work as a womaniser for me, nor as a charmer. If the story continues this way, making him into one to serve the old way that William Shatner played the character, it would make him a less interesting and believable character for the new era. So, 5 Reasons you should watch Star Trek: Into Darkness this year? 5. The special effects, sets and designs look worlds apart from the 2009 movie, which on the small screen has dated somewhat. It will be interesting to see to what degree this movie uses more special effects and explosions; the teaser certainly looks like there are going to be a lot. 4. The darker tone, as the name might suggest, looks to be the basis for a much grittier and high stakes story of loss and hope, rather than a rag-tag fleet of cute characters shooting lasers. I like this. 3. Uhura, Bones and Scotty – because I am dying to see Keith Urban break our minds again and to see Uhura really step it up in this battle. Uhura really has the chance to be a new female icon for this generation. 2. Spock and Kirk – let’s see what we have in terms of ‘bro’ development in this movie! The teaser certainly looks promising with the Spock voiceover and the touching scene where the trademark hand sign is shared. There’s a lot of room to go with the friendship, and a lot at stake if they get it wrong. 1. Benedict Cumberbatch playing the villain. What more could you possibly want for anticipation? He’s going to be amazing, and I hope, an improvement on Eric Banner’s Nero.